Buccleuch Arms Hotel is known throughout the Borders for its warm welcome, impeccable hospitality and fabulous food – no surprise, then, that it’s twice been voted Scottish Inn of the Year! The Buccleuch Arms is the perfect choice for a relaxed, contemporary wedding of up to 80 guests for dinner, and evening parties of up to 120 indoors, or 200 in our beautiful garden marquee. Couples can get married or opt for a civil ceremony in the stylish Salmon Room, or in the former lounge which has been converted into an beautiful room for ceremonies. Another option is to get married at nearby Melrose or Dryburgh Abbey followed by an elegant reception at the Buccleuch. In the evenings, the Salmon Room transforms into a chic party room that’s just right for dancing, with on-tap chilled Prosecco and a spectacular starlight fibre optic ceiling. 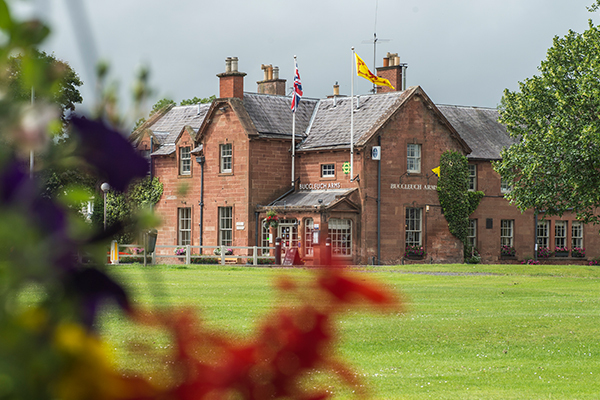 With tailor-made menus from £28, a great choice of ales and local produce, and in-house wedding planning included in your package, the Buccleuch Arms offers tremendous value. There are 19 smart boutique-style bedrooms for guests staying over, and the central location in St Boswells puts the best Borders sights, sports and shopping right on the doorstep. Browse our gallery and the Buccleuch Arms website for more inspiration!